Healthcare has been a significant topic in the recent U.S. Presidential election. There is controversy among which form of health care should be implemented. However, it’s likely that this issue will not be sorted for quite some time. As the country is looking forward towards what form of healthcare it should have, many Americans are beginning to research how good America’s healthcare is currently. Is the answer to that is a complicated one. Although all states in America are to be treated equal, they are not. Each state in the U.S. is provided with different healthcare regulations and guidelines. 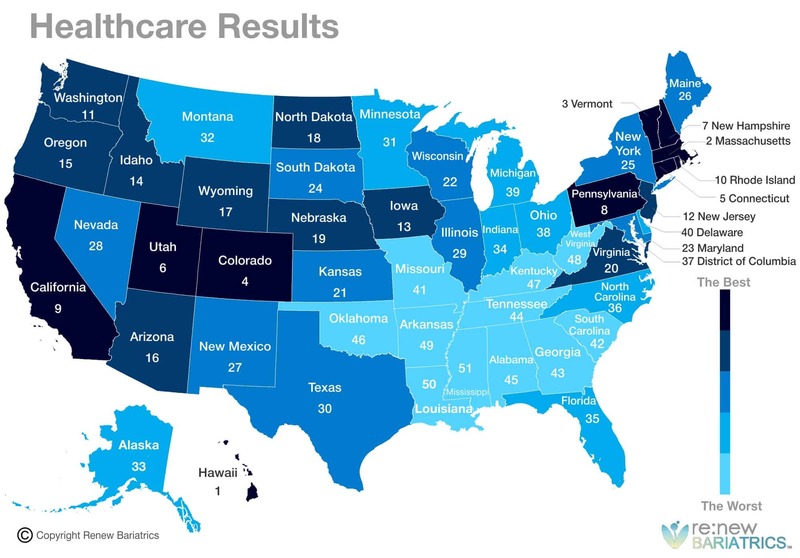 It’s important to understand which states provide excellent healthcare and which don’t. 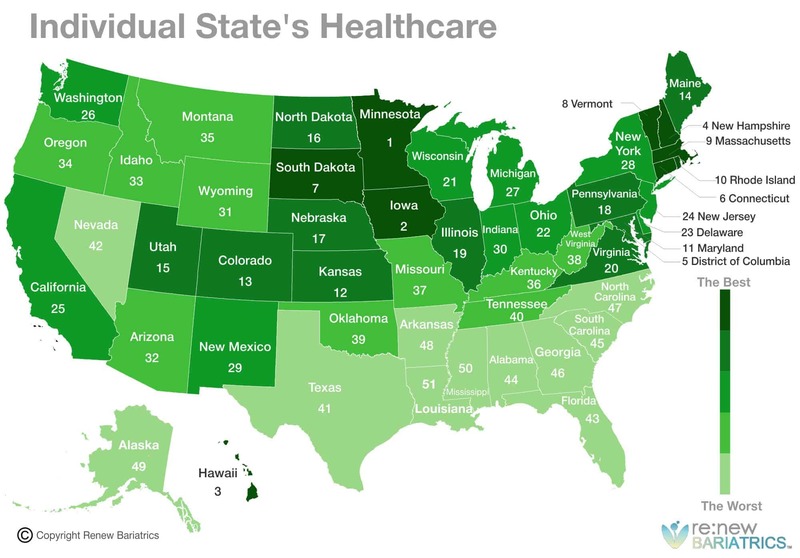 There are multiple ways to determine if a state has good healthcare. The three main points that define its quality is affordability, availability, and result. Affordability is the piece of healthcare that most people care about. Most people view all healthcare as basically the same thing, and the only thing that is different is the price. This is the wrong way to view healthcare. However, the price of the healthcare is essential because it is the first thing that must be considered. It doesn’t matter if the healthcare is available to everyone, or if it’s useful if people cannot afford it. Seeing if a healthcare system is affordable is very important to ensure its success. If a healthcare is too expensive, people won’t be as interested in even looking at what benefits the system may have. Availability isn’t a part of healthcare that many people think of. However, it is immensely valuable. Contrary to popular belief, even if healthcare is cheap, it doesn’t mean that you qualify. There are healthcare systems like Hawaii’s that are incredibly cheap. However, many citizens are unable to receive the healthcare because it’s very exclusive. Healthcare is available when it is opening up its benefits to many other people; showing that is it a system that cares about its citizens. There are healthcare systems out there that are cheap and available, yet are not effective. Some states try to make health care affordable so much that the healthcare setting in place is one that can’t help people to its full extent due to lack of financial resources. This proves to be a significant issue. People may be excited that the healthcare they found is cheap, and they qualify. However, they’d be disappointed to know that the healthcare is one that is not effective in providing healthcare to people. These three characteristics are the most vital pieces to consider when viewing healthcare. That’s why this ranking has been set in place. 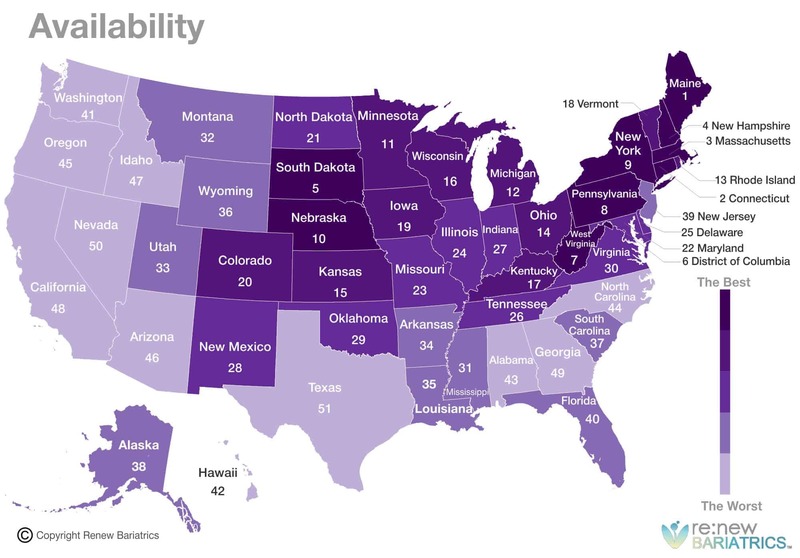 It lists each state’s overall healthcare quality in comparison to each other. The results of this ranking of the states have been produced due to the sources listed at the bottom of the article. Most sources are from government sites that display public information on healthcare in individual states. Minnesota: (Affordability 5th, Availability 11th, Result 8th). Minnesota is tied for the second-best healthcare in the country (along with Iowa). Although Minnesota is thriving with pneumonia and frostbite, the state makes it a priority that their citizens can access an effective healthcare at an affordable price. Iowa: (Affordability 2nd, Availability 29th, Result 13th). Ranking 2nd in both cost and overall healthcare quality, Iowa is a magnificent model of a proper healthcare system. Iowa’s primary focus is on making the healthcare affordable, like D.C. However, the outcomes that come from Iowa’s healthcare are better than D.C.’s ranking 13th in results. Hawaii: (Affordability 3rd, Availability 42nd, Result 1st). Hawaii is arguably the state with the best healthcare. While ranking 3rd in cost and 1st in the outcome, Hawaii appears to be the perfect place for healthcare. However, before people begin to pack their bags and book their flights it’s important to know that it is extremely difficult to attain Hawaiian healthcare. The issue is that the majority of health services are on Oahu. Meaning that due to the geography of the state, many citizens are unable to receive medical aid. New Hampshire: (Affordability 16th, Availability 4th, Result 7th). New Hampshire’s healthcare is one that is extremely reliable and available to almost all its citizens. The price of the healthcare is what stops New Hampshire from being the best. District of Columbia: (Affordability 1st, Availability 6th, Result 37th). It’s no surprise that the capitol of the United States possesses one of the best healthcare systems in the country. It is the most affordable healthcare and is available to most citizens. The downfall of D.C. healthcare is that it produces poor results. Connecticut: (Affordability 30th, Availability 2nd, Results 5th). Connecticut’s healthcare is an expensive one, yet produces impressive results. Next to Maine, Connecticut is also the state that makes its healthcare most available to citizens. South Dakota: (Affordability 7th, Availability 5th, Results 24th). Besides being known for Mount Rushmore, South Dakota is known for possessing a great healthcare system. It’s both cheap and available to citizens. However, it proves not to be very useful. Vermont: (Affordability 20th, Availability 18th, Results 3rd). Vermont is one of those states that provides excellent healthcare to few people. The system focuses on making the healthcare very efficient. However, that does come at a cost, seeing as that healthcare costs more than about 20 other states. Massachusetts: (Affordability 41st, Availability 3rd, Results 2nd). Massachusetts is the place to go for the wealthy. They provide some of the best healthcare in the country. However, the cost is quite high. Rhode Island: (Affordability 15th, Availability 13th, Results 10th). Rhode Island is one of the view states that have an excellent all-around system of healthcare. All components (Affordability, availability, and results) place very well in the listings. Maryland: (Affordability 4th, Availability 22nd, Results 23rd). Opposite of Massachusetts, Maryland is the perfect place to go for the not-so-wealthy. Maryland’s system focusses on making healthcare affordable. Even while the healthcare is cheap, it still provides adequate outcomes and is available to most residents. Kansas: (Affordability 6th, Availability 15th, Results 21st). Like Maryland, Kansas is excellent at providing affordable healthcare that is decent in delivering results and being available to most citizens. Colorado: (Affordability 23rd, Availability 20th, Results 4th). Colorado is known for having an incredibly diverse geography. From deserts to snowy mountains, Colorado’s healthcare provides one of the best results in the entire country. Maine: (Affordability 17th, Availability 1st, Results 26th). While their healthcare does not produce great results, Maine is known for having healthcare that is the most accessible in the country. Utah: (Affordability 13th, Availability 33rd, Results 6th). Utah’s healthcare is one that is not available to many residents. However, the healthcare produces excellent results. North Dakota: (Affordability 12th, Availability 21st, Results 18th). North Dakota is an evenly balanced in their healthcare system. They focus on providing adequate pricing, availability, and results. Nebraska: (Affordability 21st, Availability 10th, Results 19th). Nebraska’s healthcare is slightly above average. The price for the healthcare is definitely worth the results, but there is nothing noteworthy about this state’s healthcare. Pennsylvania: (Affordability 14th, Availability 8th, Results 31st). Although being known for its gorgeous mountains and lively history, Pennsylvania also has a good healthcare system. The government focusses on providing healthcare to as many citizens as possible. Illinois: (Affordability 10th, Availability 24th, Results 29th). Illinois’’ healthcare system is one that focusses on making healthcare affordable. However, the healthcare does not produce great results. Virginia: (Affordability 18th, Availability 30th, Results 20th). Healthcare in Virginia is one that is affordable, yet not that available. The system is one that is not very effective. Wisconsin: (Affordability 25th, Availability 16th, Results 22nd). Wisconsin’s best part of its healthcare is its availability. With availability ranked as 16th, affordability and results are lacking in comparison. Ohio: (Affordability 9th, Availability 14th, Results 38th). Being the 7th most populated state, Ohio is a place that should have great healthcare. However, the system focusses on making healthcare affordable and available, but the results are poor. Delaware: (Affordability 8th, Availability 25th, Results 40th). Delaware’s healthcare is quite like Ohio’s. The healthcare is affordable but produces great results. New Jersey: (Affordability 29th, Availability 39th, Results 12th). New Jersey focusses on making their healthcare produces great results. However, that does come at a cost. California: (Affordability 22nd, Availability 48th, Results 9th). Same as New Jersey, California’s healthcare system focusses on producing quality healthcare but is relatively expensive. Washington: (Affordability 31st, Availability 41st, Results 11th). Located in the Pacific Northwest, Washington produces healthcare that is available to very few people, yet is very useful. Michigan: (Affordability 19th, Availability 12th, Results 39th). Michigan’s healthcare is focused on providing healthcare to as many people as possible. However, the healthcare produces terrible results. New York: (Affordability 46th, Availability 9th, Results 25th). While New York’s healthcare is available to most citizens, it is also one of the most expensive healthcare’s in the country. New Mexico: (Affordability 34th, Availability 28th, Results 27th). New Mexico’s healthcare system seems to be the most mundane healthcare in the country. All three components are placed in the “average” level. Indiana: (Affordability 26th, Availability 27th, Results 34th). Indiana’s healthcare is very similar to New Mexico’s. The system is focused on making healthcare affordable. 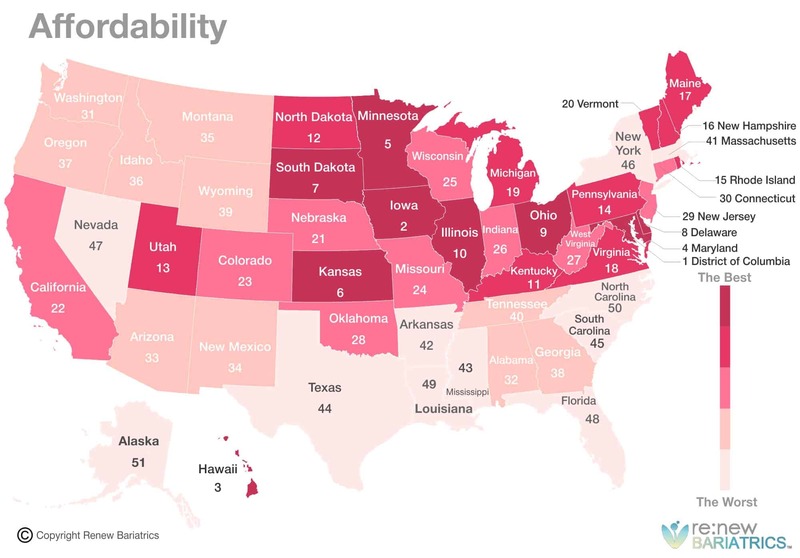 Wyoming: (Affordability 39th, Availability 36th, Results 17th). Wyoming’s healthcare is poorly rated due to it being expensive and not very available. However, the healthcare does produce good results. Arizona: (Affordability 33rd, Availability 46th, Results 16th). Similar to Wyoming’s, Arizona’s healthcare is expensive and hard to be a part of. However, the healthcare produces great results. Idaho: (Affordability 36th, Availability 47th, Results 14th). Idaho’s healthcare is one of the most exclusive healthcare’s in the entire country. However, the system provides excellent results. Oregon: (Affordability 37th, Availability 45th, Results 15th). Oregon’s healthcare is an expensive one. However, the results that Oregon’s healthcare produces are amazing. Montana: (Affordability 35th, Availability 32nd, Results 32nd). Being a farmland, Montana doesn’t have many people. However, for those who do live there they have to deal with an expensive healthcare system that doesn’t have great results. Kentucky: (Affordability 11th, Availability 17th, Results 47th). Kentucky’s healthcare produces one of the worst results in the country. However, the healthcare is cheap and easy to access. Missouri: (Affordability 24th, Availability 23rd, Results 41st). Missouri produces average costs and availability for their healthcare. However, the healthcare provides some of the worst results in the country. West Virginia: (Affordability 27th, Availability 7th, Results 48th). West Virginia has one of the most available healthcare in the country. However, the healthcare is expensive and produces terrible results. Oklahoma: (Affordability 28th, Availability 29th, Results 46th). Healthcare in Oklahoma is terrible in comparison to many other states. Its results are terrible, and the healthcare is not cheap. Tennessee: (Affordability 40th, Availability 26th, Results 44th). Tennessee’s healthcare system is both expensive and produces awful results. While their system is inadequate, the government attempts to make healthcare available to as many people as they can. Texas: (Affordability 44th, Availability 51st, Results 30th). Texas is ranked the worst state that makes its healthcare available to citizens. Although the Texan healthcare is hard to receive, it is a reasonably efficient system. Nevada: (Affordability 47th, Availability 50th, Results 28th). Nevada has the second most expensive healthcare next to Texas. However, the healthcare that few citizens receive works well. Florida: (Affordability 48th, Availability 40th, Results 35th). Healthcare in Florida is a significant issue. Florida has the 4th most expensive healthcare systems, yet has multiple problems. First, it is hard to qualify for the healthcare. And second, the healthcare does not work very well. Alabama: (Affordability 32nd, Availability 43rd, Results 45th). The healthcare in Alabama is poorly established. The system is expensive, exclusive, and produces poor results. South Carolina: (Affordability 45th, Availability 37th, Results 42nd). South Carolina’s healthcare is expensive and ineffective. The state does, however, focus on making healthcare available to all citizens. Georgia: (Affordability 38th, Availability 49th, Results 43rd). Georgia has the 3rd most exclusive healthcare in the country. Most people would think that’s because the state has great healthcare. However, the healthcare is both expensive and does not show excellent results. North Carolina: (Affordability 50th, Availability 44th, Results 36th). Ranking just two places under its counterpart, South Carolina is a state that has terrible healthcare. The system is the 2nd most expensive one and is not effective at all. Arkansas: (Affordability 42nd, Availability 34th, Results 49th). Arkansas’ healthcare produces the 3rd worst healthcare outcomes in the country. However, the state is focusing on making the healthcare accessible to as many people it can. Alaska: (Affordability 51st, Availability 38th, Results 33rd). Healthcare in Alaska is a major issue. The state provides the most expensive healthcare, and the healthcare isn’t even that accessible or effective. Mississippi: (Affordability 43rd, Availability 31st, Results 51st). While Mississippi does focus on providing healthcare to most of its citizens, it doesn’t have a very effective system. Ranking at 51st in results, Mississippi has the least adequate healthcare in the country. Louisiana: (Affordability 49th, Availability 35th, Results 50th). Louisiana’s healthcare is by far the worst in the country. While there is the effort made into making the healthcare accessible, there isn’t much for citizens to access. The state has the 3rd most expensive healthcare and has the 2nd least effective one. This is by far the worst healthcare that any state holds. The state has the 3rd most expensive healthcare and has the 2nd least effective one. This is by far the worst healthcare that any state holds. Healthcare is an essential part of an American’s life. It is critical for everyone to be aware of the quality of healthcare that their country provides, and what can be done to improve it. Today, United States is a leading medical tourism destination where figures from around the world travel to the United States to pursue the latest healthcare advancements and technology. According to Patients Beyond Borders, the United States is the 3rd leading destination for medical tourism, hosting over 800,000 patients per year. Another medical tourism destination is Tijuana, Baja California, Mexico. Mexico hosts tens of thousands of yearly visitors seeking affordable medical treatments including dental, cancer, weight loss surgery, and more.